I came to Luxembourg in July 2008. Little did I know the path I was about to embark on and that my passion for landscape photography would become such an important part of my daily work. To celebrate these 10 years, I would like to show you a few of my favourite photos made over the years in Luxembourg with a bit of story behind each of them. 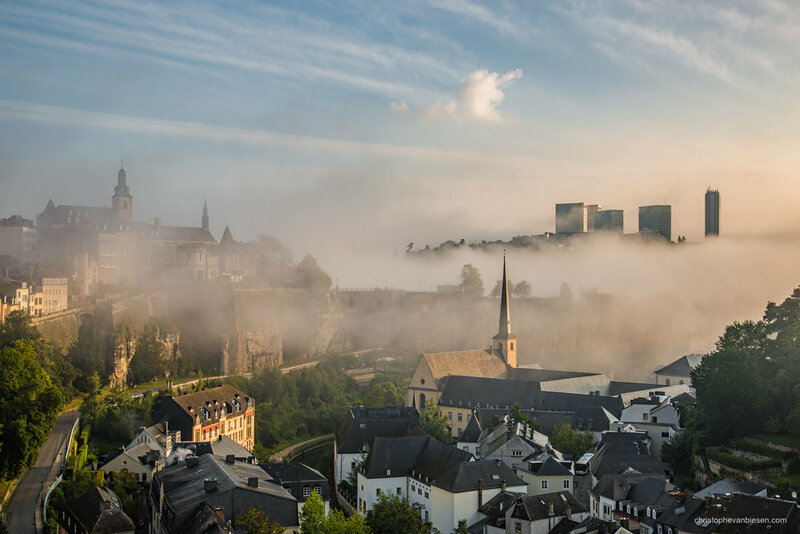 This is one of the pictures from the early days and it's most certainly one of my most popular photos made in Luxembourg: a classic view captured during one of the most stunning instants. I remember this sunset as if it were yesterday. I was out shooting with one of my best pals, who by the way I met in Luxembourg! This sunset lasted for a better part of an hour, giving me plenty of time to try different compositions, some with more sky, some with less, some zoomed in on the tower or on the bridge. But in the end I settled on this wide view of the scene which I liked most and which simply best represented that stunning sunset. I made this picture back in 2013. It's one of those views that was begging to be photographed. When I saw that winding street for the first time, I knew I wanted to create something special here, something dynamic. In truth there isn't a lot of traffic on that small street, but photography is sometimes about creating an illusion in order to represent what's on the photographer's mind. So in order to create this picture, it took a total of 18 long exposures that were later combined to include the light trails of the cars. I have now seen many photographers shooting that same location and I am happy to inspire, but remember, this is where you saw it for the first time. This is one of my absolute favourite views in Luxembourg City from atop the Sofitel Luxembourg Le Grand Ducal. You can see the whole city from up there, from the tower of the BCEE to the Notre-Dame Cathedral and the Saint Michael's Church, all the way to the skyscrapers of the Kirchberg plateau. This might also be the right occasion to talk briefly about the titles I often give to my favourite photographs. Finding a fitting title can be so challenging sometimes. May friends and family forgive me when I ask them for help! 😂 Photos and words don't always mix well. Should the title be strong or even epic, soft or poetic, funny, geeky, sarcastic, reminiscent of something particular? There are just so many options, but I like the challenge of naming my pictures and making them resonate through a few simple words. For this picture, the title came easy for once. I made this picture in late August so summer was almost over ("Summer"), but this great sunset was the perfect comfort ("Solace"). This photo remains one of my very favourites, mostly due to the memories that are related to it. I made this picture back in 2014. It was one of those years where winter was long and snowless. I was waiting and waiting for the opportunity to head out and capture the city under a thick blanket of snow. But that day just would not come... Finally, just after Christmas, the weather forecast was predicting a whole night of snow. So I was planning on getting out in the morning. The only downside was, that I was also taking a plane that very same morning. With great anticipation I got up early to find that Luxembourg was indeed finally white with snow. Having all my luggage ready, I spent a couple of hours shooting in Luxembourg City, before heading off to Quebec, Canada, where I would experience even more snow and temperatures below -30°C! This is my absolute favourite view of Luxembourg City. It is one of the city's most representative views for me which includes some of it most beautiful landmarks such as the Neumunster Abbey and the Saint Michael's Church as well as the majority of the Grund neighbourhood.. I have photographed this very view under so many circumstances in all seasons and under many different lighting conditions. This particular moment remains one of the most memorable. Not only does it include my favourite view, but I made this picture during one of my very first landscape photography workshops that I organised in the city. It was a very early morning and we got very lucky to witness the low fog rising from the Pfaffenthal and slowly making its way into the Grund over the iconic Rocher du Bock and the Hollow Tooth Tower. Luxembourg has given me so much and I am grateful to all of you for supporting my work!